On October 7th, the European University at St. Petersburg welcomed Dr. Vladimir Drebentsov as part of the ENERPO program’s “Workshop Series.” Dr. Drebenstov’s 90 minute presentation was divided into four parts: 1) the current situation in energy markets; 2) a summary of BP’s 2030 outlook; 3) the Russian oil markets; 4) the Russian gas markets. This was followed by a question and answer session with the audience. Drebentsov has been BP’s Chief Economist for Russia and the CIS since joining the company in early 2006. In this role he conducts research and offers policy advice for BP in the Former Soviet Union. His research on the subjects of European gas markets, global gas reserves, and gas trade is part of BP’s Statistical Review of World Energy, often referred to by the industry as the “bible” of energy data. In 2010 Drebenstov was appointed BP’s VP for Corporate Social Responsibility in Russia. Prior to his work with BP, Drebenstov was a Senior Economist at the World Bank from 1993 to 2006, where he specialized in the task management of lending operations and in impact assessments of institutional reforms. Before joining the World Bank, he was a Senior Research Fellow at the Institute for US and Canadian Studies (ISCAN) from 1982 to 1993, focusing on the Canadian energy sector and CIS trade relations. Dr. Drebenstov earned his PhD from ISCAN in 1990 and graduated from Moscow State University’s economics department in 1982. In his career he has authored or co-authored more than 50 academic publications. In his 90 slides, Drebenstov not only provided a broad overview of the current and projected world energy landscape but also sought to explain apparent contradictions between energy data and industry actors’ different energy policies. The last two Russia-focused parts of his presentation saw the data-analysis of the first half of his overall presentation replaced by broader, less-quantitative predictions on how Russia must adapt to the changing oil and gas scene in order to stay competitive. The first thing to mention is that primary energy consumption in OECD countries is much flatter, especially compared to non-OECD countries. We are measuring emissions from energy production and energy consumption. Another thing to mention is that, in recent years, as you see, emissions started to decline. That’s just because growth in efficiency has more than offset growth in energy consumption. So you consume more energy, but you use it more efficiently. There was actually some growth so, over these years, growth in energy consumption in OECD exceeded growth in energy efficiency. It’s only in the last five years that we have seen emissions coming from the developed world on the decline. That’s a function of primary energy consumption. However, relative to non-OECD, the growth is flat. In recent years, gas was substituted for coal in the U.S. You can therefore see that this decline in U.S. emissions was steeper than the EU’s decline, and it offset a lot of growth in European countries. For instance, it completely offset increase in carbon emissions in Japan. In Japan, carbon emissions went up last year because of coal and gas substitutions for nuclear power. 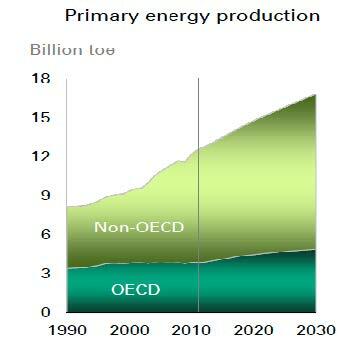 Source: BP Energy Outlook 2030. The decline in the U.S. allowed an offset to all this. Even if we look at long-term trends, it’s still basically a function of primary energy consumption. There are two contributing factors for economic growth: how much primary energy you need relative to your economic growth and the fuel mix. I mentioned only decline in primary energy consumption, that’s not completely fair. Of course, growth in renewable sources contributed to the decline of energy intensity and hence carbon emissions. It would have been much bigger if not for the policy mismatch in Europe. We think that hydro in the future will not be able to grow as fast as in the past, because the Chinese have basically tapped almost all resources that they have. They will grow renewables pretty significantly, particularly solar and wind, but they will have to grow nuclear and that is their plan. If one turns to power generation, you know that solar and wind power are intermittent sources of energy. In other words, if there is no sun shining or there is no wind blowing, you cannot produce electricity by either sun or wind, so you need some type of backup electricity source. Nuclear is, and will be, one of these sources simply because China will experience growth in what is called base load, and it’s pretty difficult to use intermittent sources of power energy. So you need something more stable, like nuclear or gas. China also has plans to grow their gas consumption: they want to increase contribution of gas to 9% by 2030 from less than 4% now, so it is a significant growth. 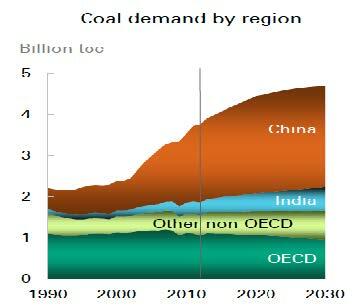 Also, coal will still be supplying most of the energy needs in China by 2030. I was showing the slide where we forecasted deceleration in coal consumption growth post-2020, but China will still be a coal-driven economy by 2030 with high contributions from nuclear, hydro, renewables, and gas. By 2030, we are still thinking that China and India will be contributing 52% of coal consumption. So to economists, this will still be a heavy reliance on coal. Well let me say that Russia would have been much better off if it had been more successful in negotiating gas sales to China. This story dates back to the late 20th century. Russia has spent over 15 years in an attempt to negotiate a gas contract with China and during this time, a lot of things have changed. China, for instance, successfully developed gas imports from Turkmenistan. Central Asian gas has closed a lot of room that would have been potentially available for Russian gas. Originally, Russia wanted to export gas to China via two routes: the western route (Altai pipeline) and the eastern route. By now nobody speaks of the western route, because after China signed the stream of agreements with Turkmenistan to purchase close to 60 bcm a year from that country, the Chinese lost any interest in purchasing Russian gas via the west. In the east, it still makes sense because there, Russian gas will be competing with LNG. Clearly, much will depend on what the LNG price will be in Asia. At the moment LNG prices in Asia are the highest in the world, and Russian gas looks very competitive. The Chinese are in no rush to agree to the price that Russia offers for its pipeline gas; they are aware that a lot of new developments are likely to happen in the LNG markets in the years to come, and by the time the Russian gas might physically start flowing to China, China might have cheaper options for buying gas. It is a pretty complicated story. We know both sides. From the Russian side, it doesn’t make sense to build a pipeline with capacity of less than 30 bcm per year. Basically if you sell less than 30 bcm per year, it’s not likely to be a profitable business. On the Chinese side, they have seen that before the recent price reforms, their importing companies had been experiencing losses on purchase of even Turkmen gas, so why would they agree to buy Russian gas at a higher price if they were experiencing such losses? But we still think there is room for about 30-40 bcm in northeastern China, but again it might well be the case that it’s more prudent for Russia to develop LNG capacity in the Far East. An advantage of LNG over pipeline gas is that you’re not tied to one market. If one market doesn’t want to swallow your gas, you try to find some other market. With piped gas, you’re doomed to sell it to just one customer. It’s an interesting thing to watch, we might see some agreement by the end of this year just because of a difference in price. Still, I think that unless Russia offers a pretty significant discount to current prices, the Chinese won’t buy their gas. Question: If Russia is unable to sign a deal with higher gas prices, what do you think this means for the viability and partnership with Rosneft/Exxon? Well actually, it is true that it is more expensive to develop gas in the Russian Far East than in the traditional provinces. On the other hand, there is an advantage in these fields, which is that they are basically wet gas. They are liquid rich. Actually if you look at the experience of the U.S., it does not impede. It actually helps in the development of these fields because you pretty much cover your costs by selling liquids, and then you get gas as a byproduct that you can sell at any price and it’s still profitable. So I wouldn’t just say that it’s more expensive to develop them. I would say that it has a lot of advantages, but the problem is that you need markets. For liquids, the market is global. For piped gas, it’s one market. For LNG, it’s the whole of Southeast Asia which will need more gas – be it Korea, Japan, India, China – so I think gas in eastern Russia will be developed and sort of LNG plants will justify building both pipelines and LNG plants to export Russian gas. Of course, one thing that should be understand is that it will require much more cost management than Russian producers, particularly monopoly producers, are used to. Again, it’s no secret that Russian pipelines are the most expensive in the world. I’m not talking about Arctic pipelines, I’m talking about pretty regular pipelines. To give you an anecdote which was published in August, I think: one guy who fled Russia published an article on how much Gazprom overpaid on just building 19 railway bridges in Yamal. 600 million dollars. That was just the expertise of the designing institute of these bridges after they went there and saw that what was supposed to be built from concrete was built from wood. Gazprom had paid for concrete, not for wood. It gives one an example of how much room there is in cutting costs in Gazprom. My point is that because of the higher competition, both domestically and on external markets, they will either become more efficient and prepare to sort of cut costs and become competitive at low prices or they go bust. It’s pretty simple. Question: I’m wondering if you could speak a little more now about the considerations that went into choosing the TAP pipeline over Nabucco West? So it will be the TAP pipeline not Western Nabucco. We are talking about gas production in Azerbaijan and about us, BP, being in a consortium that will develop the Shah Deniz II gas field. Basically, given that it’s gas produced in Azerbaijan, it needs to be sold somewhere. We opted for Europe, and in Europe we had an option between going through the Balkans and central Europe to Austria or Italy, and these were two competing pipelines. One was originally called Nabucco and then Western Nabucco and another one was called TAP. Basically we opted for the latter, so we will sell our gas in Italy, but again I’ll be able to say even more next year because we haven’t taken the final investment decision on Shah Deniz yet. It will be taken by the end of this year. So we have chosen between pipelines, so the next thing is just to agree that this gas field will get developed at all because if we don’t take an investment decision, then the gas will not be produced and it will not make sense to even speak of TAP, so let’s wait. It’s an ongoing process. In terms of the global energy picture I think our gas, and we are only going to sell about 10 bcm from Shah Deniz II to Europe, it is equally interesting to look at what will happen in Israel or between Cyprus and Israel. Israel is considering building a 16 bcm pipeline to Turkey. So again, that actually gives one a clear idea of how fast gas markets are changing. Some things which nobody even thought about a few years ago will be really crucial ideas in just a few years. Question: Do you think there is any chance Gazprom will switch to spot pricing in the next five to ten years? Yes, these are interesting dynamics to observe. Let me mention a few things. First, it is not absolutely correct to say that Gazprom sells its gas in Europe only at oil index prices, although I admit I was saying this myself. Actually, Gazprom has been selling close to 7-8% of its gas in Europe at spot prices for the last 5 or 6 years. And perhaps I’ve mentioned this in my previous presentations here. It’s very easy to capture; you just open the Customs Book Statistics in Russia and look for the line which sells gas exports to the UK. And that’s exactly the gas, that which is not sold in the UK, because there is no technical capacity to sell Russian gas in the UK. At least not before Gazprom builds a fourth leg of Nord Stream to the UK. So Gazprom at the moment sells 93% with oil indexation and 7% at spot prices. Okay, let’s see what happens. If oil prices go down and the oil index prices become lower, then the spot price is fine. Gazprom will sell more via the Gazprom market and then trade it, that’s not a problem – they know how to do that. So for them, the current situation, no matter how unpleasant it might look from the European end, is pretty pragmatic and rational. As long as someone is prepared to pay at the oil indexed price, they will sell at this price. Actually speaking of Nord Stream 3 and 4 – for me, the extension of Nord Stream 4 is a clear indication that Gazprom is prepared to sell gas at spot prices. Michael Camarda and Stephanie Bryant are MA students in the ENERPO program at European University at St. Petersburg.